There is no such thing as a good time for your dog to get violently ill, but Christienne O’Rourke of Long Island, New York, knows that there most definitely is a bad time. A couple of months ago, O’Rourke found herself shuttling back and forth to the hospital, where her grade-school son had been hospitalized for almost a week. And then the family’s 3-year-old Rhodesian Ridgeback, Kaos, became suddenly ill as well. Kaos recovered from his ill-timed bout of serious digestive distress, which may or may not have been caused by his raw-food diet. Many symptom-free dogs also have Salmonella present in their stool. One evening, returning from the hospital, O’Rourke returned to find Kaos squeezed into a corner of his spacious crate, desperate not to step in the pool of diarrhea that was seemingly everywhere. As soon as O’Rourke opened the crate door, Kaos ran to the backyard, only to come back in leaving a trail of bloody diarrhea. Panicked, O’Rourke took Kaos to a 24-hour emergency practice, where the attending veterinarians placed him under observation, gave him fluids and started a diagnostic work-up. “Nobody could watch him for me, so I kept him in the emergency room,” says O’Rourke, whose son and dog both pulled through their medical emergencies and are now home and back to their regular lives. But the $4,000 price tag for that prolonged veterinary care “brought me to my knees,” she says wearily. Four days after Kaos was admitted, the test results came back, showing Salmonella in his stool. A third-generation raw-fed Ridgeback, Kaos had been on a home-prepared raw-food diet since he was three weeks old. But, spooked by the diarrhea and the vet bill, O’Rourke switched him to a high-quality brand of kibble. Depending on your point of view, Kaos’ story is either a cautionary tale about the dangers in raw-food diets – or an equally telling example of how raw-food diets are reflexively blamed for episodes of intestinal distress. After all, it wouldn’t be unusual for a raw-fed dog like Kaos to have Salmonella in his stool. And the emotional issues at play – the intense stress that a sudden hospitalization put on the family, the abrupt change in routine, and long periods of being crated home alone – could very well have triggered the explosive diarrhea that Kaos experienced. Just how dangerous is Salmonella, not just to the dog that is infected with it, but the other animals and humans around him? To say Salmonella is ubiquitous is an understatement: According to the Centers for Disease Control, this rod-shaped bacterium – named for the 19th-century scientist who discovered it, Dr. Daniel Salmon – is responsible for 1.2 million food-borne illnesses in humans, with 19,000 hospitalizations and some 400 deaths every year. Thanks to dogs’ industrial-strength digestive systems, their strong stomach acids usually disarm the Salmonella bacteria before they can cause illness. And even if enough of the bacteria survive and manage to take up residence in the dog’s digestive tract, he may well be completely asymptomatic; not all canine carriers of Salmonella become ill. This makes it difficult to know how widespread Salmonella infections are in the canine population. The Merck Veterinary Manual says that “many” dogs are Salmonella carriers, adding that, unlike in humans, “clinical disease is uncommon.” Other estimates of Salmonella infection say that as many as a third of dogs carry the bacteria. Though it’s relatively uncommon for dogs to actually become ill from ingesting Salmonella – the illness is called “salmonellosis” – the canine symptoms are similar to those seen in humans, including diarrhea, sometimes with blood and/or mucous; vomiting and refusal to eat; fever; lethargy; and abdominal pain and cramping. Treatment usually involves the administration of fluids and electrolytes to avoid dehydration, and sometimes anti-diarrheal drugs. There is disagreement over the use of antibiotics in mild cases of salmonellosis, because of concerns that it may contribute to the microbe’s resistance to the drugs. Mild cases can often be dealt with at home, provided the dog can be properly hydrated. In rare cases, a Salmonella infection may progress to sepsis – a systemic infection carried through the bloodstream. It’s also important to note that dogs who have been infected with Salmonella can shed the bacteria in their feces for four to six weeks. While salmonellosis can be contracted through the consumption of raw meat, the reality is that the microbe can be found in many places in the environment – including, from time to time, in commercially produced kibble! Though extrusion (the high-temperature, high-pressure process that cooks kibble) kills the bacteria, the product can be recontaminated later, in the process of drying, cooling, application of an oil coating, or packaging. Concerns about Salmonella in pet food peaked in the last decade, due in large part to the heightened attention that the United States Food and Drug Administration (US FDA) has paid toward food contaminants in the wake of the 2007 recalls of foods containing the toxic substance melamine. In 2012, multiple brands produced by Diamond Pet Foods in the company’s Gaston, South Carolina, facility were recalled after being linked to cases of salmonellosis in humans. According to veterinarian and natural pet-care advocate Dr. Karen Becker of Bourbonnais, Illinois, “There are endless sources of Salmonella present in the environment, but most do not cause pathogenic contamination,” meaning the source can test positive but never cause illness. Pools of standing water, unwashed vegetables, buildings that contain rodent populations, open fields where birds fly overhead, the areas around bird feeders and bird houses, and, yes, bags of commercially produced dry kibble – all are potential sources of contamination. In humans, potential contaminants are just as diffuse: Salmonella can lurk in the feed given to livestock animals, and waste from dairy-cow and pig factories can leach into water supplies used to irrigate crops. A 1998 study from the University of Arizona found that bacteria-covered chicken carcasses so contaminated kitchens that appreciably more pathogens were found on sponges and dishtowels than on toilet seats in the same households. Still, in dogs, raw-food diets remain the poster child for Salmonella transmission. In November 2013, the FDA issued a warning about feeding raw-food diets to companion animals, cautioning that owners had a higher risk of getting infected with Salmonella and another common foodborne bacteria, Listeria monocytogenes. The warning was issued after a two-year study by the FDA Center for Veterinary Medicine, which screened 196 samples of pet food and found that 15 were positive for Salmonella and 32 were positive for Listeria. The news made some pet professionals far more paranoid than others. We heard of a case in Sudbury, Ontario, where veterinarians decided to quarantine any raw-fed patients, even if they were coming in for something as innocuous as a wellness check. Depending on the practice and the staff member, protective gloves and even surgical masks were used during examinations. In a podcast last year on the subject of Salmonella contamination and raw feeding, holistic veterinarian and author Marty Goldstein noted that his Smith Ridge Veterinary Center in South Salem, New York, sells 2,500 to 4,000 pounds of raw food each month, with no ill effects. “Salmonella poses virtually no threat to most dogs,” he said, noting that according to the Morris Institute, 36 percent of healthy dogs carry Salmonella in their digestive tracts. Dean Ricard of Mountain Dog Food in Edmonton, Alberta, Canada, is a member of the Canadian Association of Raw Pet Food Manufacturers, or CARPFM, which has set up guidelines, third-party inspections, and best practices to prevent bacterial pathogens from infecting pets and people. Ricard notes that there is no “acceptable” level of contamination for Salmonella. Either a sample has it, or it does not, and if it’s the former, the product fails inspection, even if the bacterial load is miniscule. “Many people believe that any Salmonella in the product will cause problems, when in fact there have to be minimum levels of contamination before there is a problem,” he explains. Ricard says the best way to ensure that raw-food products are free of Salmonella is to have a clearly defined “chain of custody” of the product, from the supplier who rears the chickens to the pet food manufacturer who packages the finished product. And he reminds that precisely because Salmonella is so commonplace, opportunities for contamination await at seemingly every corner. “Many people believe it’s the process of raising the chickens that contributing to the Salmonella outbreaks,” including keeping them in highly confined quarters, Ricard says. “But the reason they wind up in barns is to prevent Salmonella from getting into the food stream.” Ironically, while more and more consumers want free-range poultry, the natural way those animals are reared leaves them vulnerable to Salmonella contamination, such as from the droppings of a passing critter or a bird flying overhead. All that said, Ricard notes that the frenzy to make our lives – and our food supplies – free of microbes might do more harm than good in the long run. Akin to the old-fashioned philosophy that says letting little kids hunker down in the dirt to make mud pies builds up much-needed immunity, there is a growing awareness that hygiene-obsessed first-world cultures are weakening their immune systems in their quest for a pristine world. According to experts, we should never rinse raw chicken or other meats in the sink in this manner; if Salmonella is present, this is a great way to distribute it (in water droplets) all over the kitchen. While most dogs can encounter Salmonella without becoming symptomatic, that’s not always the case with weak, ill, old, or immune-comprised dogs. What’s a concerned owner to do, if even commercial kibble diets carry with them the risk of contamination? 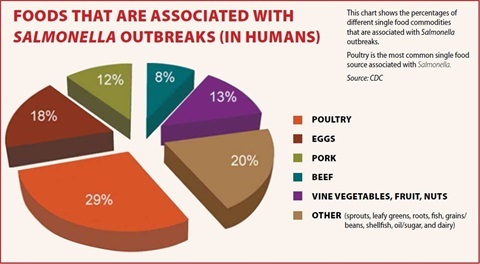 As for humans living with raw-fed dogs, the same concerns apply: Preschool children, the elderly, pregnant women, and the chronically ill or immune-compromised are at greater risk for Salmonella infection. - Thoroughly wash hands with soap and water for at least 20 seconds after handling raw pet food, and after touching surfaces or objects that have come in contact with the raw food. Countertops, the inside of refrigerators and microwaves, kitchen utensils, feeding bowls and cutting boards are all potential sources of bacteria. - Thoroughly clean and disinfect all surfaces and objects that come in contact with raw pet food. (The FDA stresses the difference between those two verbs: Cleaning means only removing germs from surfaces and objects; disinfecting means actually killing them.) The FDA recommends first washing with hot, soapy water, then following with a disinfectant, such as one tablespoon of bleach dissolved in one quart of water. Running utensils and cutting boards through the dishwasher after use can also disinfect them. - Freeze raw meat until you’re ready to use it, and thaw it in the refrigerator or microwave, not on the countertop or sink. - Carefully handle and segregate raw food, and don’t rinse it, or you can splash the raw juices onto other food and surfaces. - Immediately cover and refrigerate leftover food. - Avoid kissing your dog around his mouth, and don’t permit him to lick your face, especially after he has just consumed a raw-food meal. In the end, like most things in life, managing your dog’s exposure to Salmonella – dietary or otherwise – isn’t black and white. If you want the benefits of a raw-food diet, then you need to accept a degree of risk, to both your dog and yourself, in terms of exposure to pathogens like Salmonella. That said, other commercially prepared foods are not without risk, either – and Salmonella is only one of them. You will have to weigh the pros and cons and make the decision that’s right for you and your dog. The founder of Modern Molosser magazine and a regular contributor to WDJ, Denise Flaim raises 12-year-old triplets, as well as raw-fed Rhodesian Ridgebacks, in Long Island, New York.